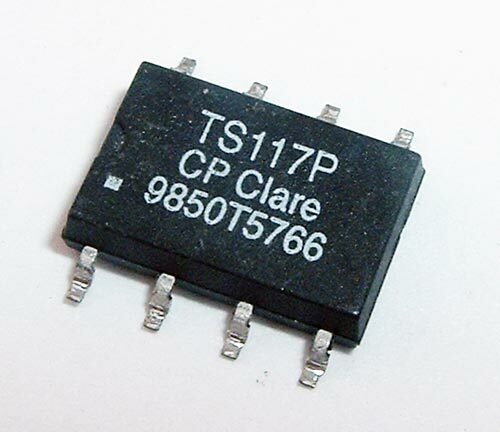 The TS117 is a single package 1-Form-A relay with an optocoupler. Load Voltage (Peak): 350V max. Load Current (Continuous): 120mA max. ON Resistance (IL=120mA): 35Ω max. Off-State Leakage current (VL=350V): 1uA max. Output Capacitance (50V; f=1MHz): 25pF typ. Input Control Current (IL=120mA): 50mA max. Input Voltage Drop (IF=5mA): 1.4V max. Reverse Input Voltage: 5V max. Reverse Input Current (VR=5V): 10uA max. Phototransistor Blocking Voltage (IC=10μA): 50V typ. Phototransistor Output Current (VCE=5V, IF=0mA): 50nA typ. Current Transfer Ratio (IF=6mA, VCE=0.5V): 100% typ. Input Control Current (IC=2mA, VCE=0.5V): 2mA typ. Input Voltage Drop (IF=5mA): 1.2V typ. Input Current-Detector must be off(IC=1μA, VCE=5V): 25uA typ. Input to Output Capacitance (Relay Only): 3pF max. Input to Output Isolation: 3750Vrms min.